Chef Helge Brandstatter of the Vintage Dining Room on the cover of Okanagan Life's first Best Restaurant issue. 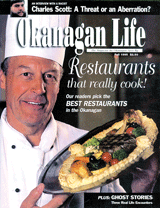 Best Restaurants (1995): The Okanagan has a better than average mix of terrific dining establishments. Okanagan Life turned to its readers to rank the best of the best and has compiled the first Readers’ Choice of their favourites in 35 different categories. Best of the Okanagan (1996): Now you can find out what Okanaganites consider to be the “best of the rest,” including best place to buy shoes, lingerie and fresh vegetables; best TV and radio personalities; best Okanagan tradition and much, much, more. Read the original features: 1995 Fall Best Restaurants & 1996 Fall Best of the Okanagan. 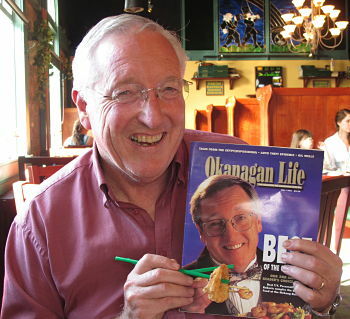 2013: Best TV Personality Mike Roberts holds the debut Best of the Okanagan issue from 1996.